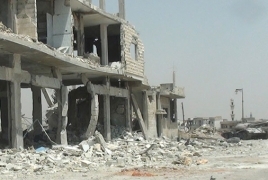 PanARMENIAN.Net - The Syrian army and its allies said they were poised to declare victory in Aleppo after rebel defences collapsed on Monday, December 12, leaving insurgents in a tiny, heavily bombarded pocket of ground, France 24 reports. Reporters in the government-held zone said the bombardment of rebel areas of the city had continued non-stop on Monday, and a civilian trapped there described the situation as resembling "Doomsday". "The battle in eastern Aleppo should end quickly. They [the rebels] don't have much time. They either have to surrender or die," Lieutenant General Zaid al-Saleh, head of the government's Aleppo security committee, told reporters in the recaptured Sheikh Saeed district of the city. Rebels withdrew from all districts on the east side of the Aleppo river on Monday afternoon after losing Sheikh Saeed in the south of their pocket in overnight fighting, the Syrian Observatory for Human Rights said. In government-held districts soldiers started to fire into the air in celebration, carving tracer bullets into Aleppo's night sky, and car drivers honked their horns at what they believed was imminent victory, state television showed. The rebels' rapidly diminishing enclave had halved in only a few hours and Observatory director Rami Abdulrahman described the battle for Aleppo as having reached its end. An official from Jabha Shamiya, a rebel faction that is also present in Aleppo, said the insurgents might make a new stand along the west bank of the river. "It is expected there will be a new front line," said the official, who is based in Turkey. The Syrian Observatory for Human Rights said that four weeks into the army offensive at least 415 civilians, including 47 children, had been killed in rebel-held parts of the city. At least said 364 rebel fighters have been killed in the eastern sector, the Observatory added. It said rebel shelling of government-held west Aleppo had killed 130 civilians including 40 children. Congress Turkey Caucus co-chair honors Armenian Genocide victims The lawmakers laid flowers at the eternal fire to pay tribute to the memory of 1.5 million victims of the Armenian Genocide. Giant prehistoric lion fossil discovered hiding in museum drawer A carnivore paleontologist opened a drawer of Ice Age specimens and noticed a row of huge teeth staring back at him.